You’re probably thinking “I know how to talk to people”… maybe YOU do, but are you SURE that your personnel do too? You may have a person who came across awesome during your interview with them, they have phenomenal interview skills, carried themselves impressively… but are you that sure of how they will respond and behave in a stressful situation? Unless you and your staff are in some career field that exposes you to loud, rude, obnoxious people on a consistent basis there is a good chance there are things and you are doing and saying that may actually escalate a situation… For example there are people who are touchy feely and who mean well, want to hug or place a comforting hand on a person’s shoulder, BUT if that person they are trying to comfort and calm down is NOT ready to receive all that love and touching, that situation may blow up. During the critique phase of my scenario training we go over what was done right and what could be done differently and what to avoid doing! The training is important because this is where you want to learn what it is you can be doing better, differently, and it is during this training that we are going to validate and reinforce in you what you are already doing correctly. So anyway, there was this long time employee who got fired, and witnesses say this man began to get loud and upset, and the manager, a female, responded by getting loud in return. After a few moments witnesses stated that another employee, a male, apparently must have felt he had to come to the rescue or aid of the female manager and now there were 3 people angry and loud. After a few minutes the employee who had been fired finally left, and then came back with a gun and killed the manager and the other employee before killing himself. 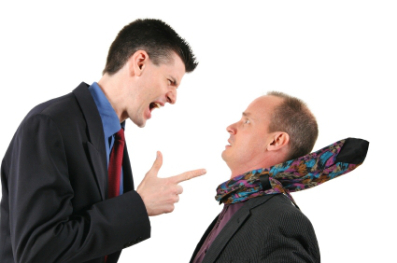 Why conflict de-escalation training? Why is that important? What if some basic conflict de-escalation techniques had been attempted? This long time employee had just been fired, of course he is upset, hurt, even humiliated. That person is expected to be upset, why not just let them vent? In my 20 years experience as a police officer and my observations in life in general I found that a large number of people who are upset just need to vent. How many of you can also relate to just needing to vent about something? And once you can connect and identify with something that is bothering a person you are on your way to de-escalating a situation. And I am not aware of a situation getting any better any sooner with both people yelling at each other. Then the other male employee gets involved. It is a basic male animal urge to come to the rescue of a female, and apparently this other male employee felt he needed to get into the argument and joined in. So now the fired employee has TWO people yelling at him, and he may have felt “crowded” within that office, felt ganged up on. IF the female manager had just let the fired empolyee vent, and not said anything, there is a good chance the other male employee may not have felt compelled to insert himself into a situation that did not include him in the first place. I want to make sure there is NO misunderstanding here, Absolutely ALL blame for this tragedy is on the shoulders of the loser who felt he had to take a gun and murder these 2 innocent people before killing himself, HE made that choice and he alone bears full responsibility of how he responded to the situation. The manager was just doing her job. Are you sure that as you and your personnel do your jobs and handle inter-personal stress and conflict that you are not inadvertantly doing or saying things that may actually escalate a situation? That’s why it is very important to have conflict de-escalation training, and not just once a year either, you do not develop skills and confidence in anything from just doing something once a year or every other year. Contact me for information about conflict de-escalation training!